I set up on Club property at day break on a beautiful Friday morning, the end of the third week. The self photo is where I was setting, nestled up against the tree with scrub bushes all around me. My setup was a tom decoy with real turkey feathers and facing my hen decoy about 15 yards apart, and 25 yards out from my blind. My habit is to always take a book with me to pass the time. I'm looking up every 15 to 30 seconds for any activity. About 8:30 AM on a bright sunny day, I looked across the field about 150 yards out and strutting towards me is this big Tom gobbling every 2 to 3 minutes. 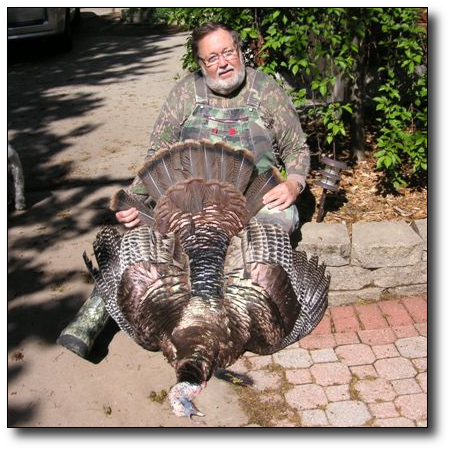 He struts along a point of trees going parallel to me so I reached down and gave him a light cluck with my box call. He turned and came right for my Tom decoy. I shot him in the head at about 30 yards out with my full choke Beretta semi-automatic. 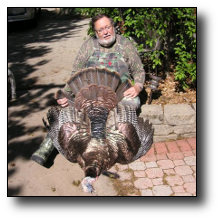 He weighed 25 pounds plus had 1 1/2 inch spurs and a 12 inch beard. I always carry a duck decoy bag that has attached back pack straps. It is very handy to put the turkey in and so I packed out about 1 1/2 miles. I was very fortunate as the next day, which was the second to the last day. I went out late, as it had rained that morning. So I didn't start hunting until 8:30 and had about a 2 mile hike. Set out my decoys and sat down to read my book. About 10 I looked up and there was a tom with 5 other turkeys. He was ready to attack my Tom and was so close to my decoy I was concerned about hitting the decoy. I took careful aim and nailed him in the head. What way to end a great spring season. Another bonus is that hunting is only 15 miles from home.